This once-a-month blogging thing has got to stop. Yes, I miss it. But, I have no idea why I haven’t been blogging. Lately, though, it has seemed overwhelming to do. Yet, here I am… I have a lot to tell you about my knitting world lately. For some reason, I got it in my head a couple of weeks ago that I want to make a shawl. I’ve been wearing wide scarves over my shoulders all winter. They all have been store-bought, and I have had a bit of knitter’s shame in that none of what I have worn has been anything I’ve made. You wanna know why that is? There IS nothing I have made. A few hats, an i-cord scarf, and lots of unfinished objects. I am the true embodiment of a process knitter; I start a project, eager to learn something new, and then once I get the concept, I quickly get bored. So, there’s not a lot to show for my “career” as a knitter. But, back in November, when I visited Woolstock, I discovered the wonder that is Koigu. I bought 8 skeins, intent on making a shawl. Of course, it can’t be just ANY shawl. It had to be the PERFECT shawl. And so, the agonizing began. Agonizing, because… here’s the thing. I love the idea of lace, but I really don’t like “old lady” lace. I’m 45 with purple hair for gosh sakes, I’m fighting my age tooth and nail. So, I had to find the right stitch patterns, and style and shape of shawl. Enter the book, Crazy Lace:an artistic approach to Creative Lace Knitting by Myra Wood. (Whoa! Check out the CRAZY price on that thing! I swear, I paid less than 20 a few months ago. Is it out of print already?) This book is a really cool concept, and explains that lace can be whatever you want it to be, symmetrical, or not, orderly, or not… that as long as you understand some basic concepts for the shape you want, you can do anything you want with the holes and the decreases. Really. ANYTHING. The thing is, I’m not quite that brave. Not yet. I want to be, but I’m not there. Still, the book was a great read and I will refer to it often every time I need a knitting confidence booster. Then I thought I would love to try knitting a Faroese Shawl. The concept of this shawl appealed to me because as a person in a wheelchair, I have trouble keeping shawls in place on my shoulders. 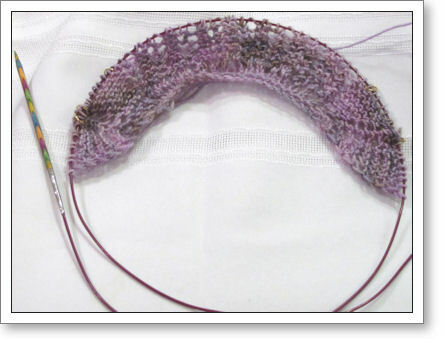 And the shaping looked like just the thing that would make this shawl easy to wear. I looked at some basic shaping instructions from this site. I understand the concepts laid out in this site, but I just couldn’t wrap my head around it. Not yet. It was making my brain hurt, so I ripped it out after only the first few rows. I tried again and again, but the confusion never lifted. So there went that idea. Then I looked around Ravelry, and there it was: The Pi Are Square shawl. (There’s a good example of one in this photo on Flickr.) Put simply, it’s round in the back, and square in the front. with shoulder shaping. This seemed perfect. Of course the creator of this beautiful design was none other than my knitting herone, Elizabeth Zimmermann. I have most of her books so I pulled my copy of Knitting Around off the shelf, and luckily, it made perfect sense! And off I went. I am enjoying looking at all sorts of lace books, coming up with patterns and ideas. Maybe I’ll even get a little crazy. If I’m brave enough. We’ll see.